A Behind the Scenes Look at the Animation Process of Shrek! 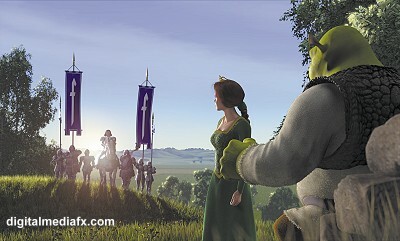 Several years ago, PDI (a subsidiary of DreamWorks and the animation company behind ANTZ) was handed the challenge of breathing life into the characters and environments of Shrek. The task would be much more difficult than with ANTZ, simply due to the variety and vast shape differences of Shrek characters. "You have Shrek, who's huge, Fiona who is small and lithe, and a short, squat Donkey," says Simon J. Smith, who headed the layout team. "So it was sometimes difficult to find the right camera angles for everyone." Character shapes, sizes, and variety weren't the only challenge, however. The directors were insistent on a realistic and magical environment. "When we started Shrek, we wanted to make a fairy tale come to life; as if you opened a storybook and stepped into that world," says Andrew Adamson, one of the film's directors. "We envisioned a magical environment that you could immerse yourself into," adds Aron Warner, one of the film's producers. "Every leaf on every tree moves, the dirt moves, the dust rolls; there's a sense of atmosphere, a sense of weight to all the props. You can almost smell it." 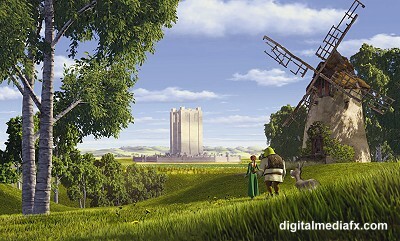 Creating the world of Shrek would ultimately involve 36 separate in-film locations, which DreamWorks claims is more than any previous computer animated feature. The first step in bringing the environments to life was research trips by the art directors. On one trip, art director Douglas Rogers was chased by an alligator while checking out Swamp locations in South Carolina. Rogers, along with fellow art director Guillaume Aretos traveled to several locations inside the U.S. (like Hearst Castle) and outside the U.S., like the Dordogne region of France, which also served as the inspiration for the settings in the movie Ever After. The art directors were impressed enough with the Dordogne region to make it the inspiration behind Duloc in Shrek. The swamp aspects of the research trips provided inspiration for Shrek's swamp home. "We designed Shrek's swamp to be a very organic environment, more like a hovel that he built using materials he found in the swamp," says production designer James Hegedus. "It's wet, mucky, and overgrown; perfect for him." In-film locations were finalized and as demonstrated by past DreamWorks animated movies, color and mood was of the utmost importance. "It's [Duloc] a very linear, angular setting; pristine, minimal, and hard," says Hegedus. "The colors are cool, the tones are subdued. What we tried to do was reflect the characters in their environments. Shrek is tied to earthiness, Farquaad to a more controlled space, and Princess Fiona is between those two worlds." 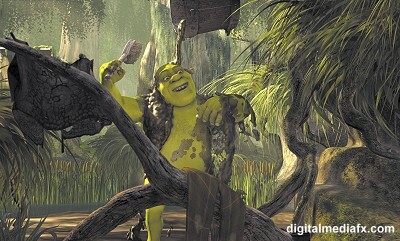 Putting the characters into the Shrek environment and animating them with many unique camera moves (like crane shots) presented some of the biggest challenges. An enhanced version of PDI's proprietary facial animation software/hardware was used to bring the character performances to life. Since performances are enhanced by expressions and emotions, those must come through very clearly to the audience, without looking staged. "Shrek is an ogre, but at the same time, he has the same range of emotions as any of us," says supervising animator Raman Hui. "In fact, the most challenging animation to do was when Shrek is hiding what he is really feeling; saying one thing, but thinking something else. Animators are just like actors. It's up to us to put all those emotions into the face." Before characters could perform, however, they first had to be built. "Essentially, the skull of the characters is formed in the computer and covered with computer recreations of the actual muscles of the face. The skin is then layered over and programmed to respond to the manipulations of the muscles as would a human face, complete with wrinkles, laugh lines, and other imperfections. Hundreds of controls are wired into the face like human nerves, enabling the animators to go far beyond the speech phonemes for the correct lip synch." The complexity of the software allowed PDI to apply percentages to command combinations in order to achieve the desired expression. The same type of layering worked for the body of each character, as well. A skeleton was built then populated with layers of muscles, skin, and even clothing. PDI used what they call a "Sharper" program for the deformations of skin and clothing. According to DreamWorks, the Sharper program, "is a layering process that deforms the surface from the inside out. When you modify the innermost layer, the change extends outward to ultimately change the exterior shape. It is taken from the same principle that causes your arm muscle to flex when you bend your arm." PDI used a shader (these programs have names, but PDI is being quiet about what software it uses) to assist with its rendering in order to achieve realistic skin for all the characters. This involves changing various rendering properties like the changing of textures (should the princess have smooth skin or bumpy skin?) and other specular controls. Lighting is one of the most difficult and important aspects in animating a movie. Like color, lighting can help shape the mood, environment, and realism of the scene. Just take a look at the credits and you'll see that there were nearly three dozen Shrek artists dedicated to lighting alone. Lighters must worry about dozens of elements in lighting a scene, from mood lighting to how light penetrates, refracts, and reemerges from a character's skin. According to DreamWorks, "More concentrated light created a natural radiant shine, while broader sheens simulated the top layer of dead skin we all have. It was a difficult balance to maintain because too much shine would result in a look like a plastic mannequin." One of PDI's challenges with the Donkey's fur was making the fur flow smoothly so that it didn't look like a Chia Pet's fur. This fell into the hands of the surfacing animators who used flow controls within a complex shader to provide the fur with many attributes (ability to change directions, lie flat, swirl, etc.). It was then the job of the visual effects group, lead by Ken Bielenberg, to make the fur react to environment conditions. Once the technology was mastered, it was able to be applied to many aspects of the Shrek movie including grass, moss, beards, eyebrows, and even the threads on Shrek's tunic! Human hair was a different story. It required a separate rendering system and a lot of attention from the lighting and visual effects teams. PDI used its Fluid Animation System (nicknamed FLU) for any scenes requiring fluid rendering. According to DreamWorks, "the system enabled them to create a range of liquids with different viscosities - from water to mud to beer to lava to milk. Imagine digital spheres flying around in free space, which, as they collide, form a singular isosurface, which can be more or less dense resulting in different thickness'. Using FLU, animators had full control over all aspects of liquid including the mixing of liquids, direction of the flow, and even collision aspects of liquid (like hitting the bottom of a glass). But what about characters interacting with fluid? There was, of course, research done first. "We took one of the guys, put him in a yellow slicker, and dumped mud all over him," says Ken Bielenberg, the film's visual effects supervisor. "Besides being fun, it gave us a good reference to see how mud behaves." From lighting to fur and layering to fluid control, PDI met the challenge handed to them to bring Shrek to life. The audience will never think of the small details that took years to create or about how many people it took to bring Shrek to life. But that's fine with DreamWorks. Their job is to mask the effort that went into the animated movie so that people don't think about those things. DreamWorks wants people to get lost in its world. As director Andrew Adamson says, "All the effects are there to bring a richness and a reality to our world, which is invaluable when you're trying to create an illusion of life."